The credit rating of St Kitts and Nevis, the smallest independent state in the hemisphere, took a hit when it defaulted on a bond payment the end of November. The administration of Prime Minister Denzil Douglas, in the midst of developing a debt rescheduling package with the help of London-based consultants, White Oak Advisory, to meet IMF stringencies, announced Wednesday its “inability to make payments for a bond which became due on November 25”. With the current global focus on the possible collapse of the Euro because of the precariousness of the Greek economy within the European Union, watchers of Caribbean regional integration will be concerned about the evolution of the Organisation of Eastern Caribbean States (OECS) – pop 550,000, which shares a common currency and is deepening economic and financial ties among its eight members that include the federated islands of St Kitts and Nevis (pop 51,300). “As one of the most heavily indebted countries in the world (public debt around 200 per cent of GDP), the credit rating for SKN was pretty low before this credit event took place,” said Arjoon Harripaul, head of ratings and research at Caribbean Information and Credit Rating Services Ltd (CariCRIS), the region’s credit ratings agency based in Port of Spain, Trinidad, in response to an Abeng News query. “Wednesday’s development means that the rating for (the) Government of SKN would now be D – Default,” he said, explaining that CariCRIS does not have a public rating on the Government of St Kitts and Nevis. “However, as part of our benchmarking and monitoring of developments in the Caribbean, we do maintain a private rating on each Government in the Region,” Harripaul added. Maybe because there isn’t an Occupy movement in Basseterre, or because the people of one of the most indebted nations in the world aren’t like Greeks ‘behaving badly’, the news didn’t cause a stir in the region. The Federation’s ministry of finance, in a “Creditor Update” on its Web site, said the government was in “advanced discussions” with the Barbados-based Caribbean Development Bank (CDB), which it owes about $380-million of its nearly EC$2-billion debt, to provide “a possible partial guarantee from the CDB to be attached to the new instruments that will be issued by the Government to participating creditors as part of the comprehensive debt restructuring exercise that is currently underway”. Accompanying the loss of preferential sugar and banana markets in the EU, their tourism mono-industry economies have taken a battering from the crisis facing Western economies. The Eastern Caribbean Central Bank (ECCB), headquartered in Basseterre, which manages the activities of the East Caribbean Currency Union (ECCU), had already set up a Debt, Growth and Development Task Force. The bank’s 71st meeting of its Monetary Council, October 21, received the task force’s “preliminary findings and views” on: the evolution of debt in the ECCU; the growth/debt nexus; a strategy for achieving debt sustainability; and strategies for attaining sustainable growth. According to the ECCB’s Web site, the monetary arrangements are characterised by: the issuance of a single common currency, the flow of which is unrestricted among its members; a common pool of foreign exchange reserves; and the existence of a Central Monetary Authority which decides on the Union’s monetary policy. 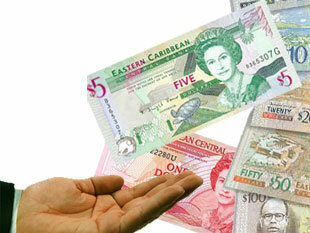 It has maintained an exchange rate of about 37 US cents to the EC dollar for more than 30 years. In February 2010, the IMF approved a billion dollar agreement with Jamaica (pop 2.6 M), the most populous of the 15 Caribbean Community (CARICOM) countries, of which the OECS is a subset, after the then prime minister, Bruce Golding, successfully negotiated a restructuring of domestic debt. That restructuring, incorporating lowering interest rates on the principals as the centrepiece, has had limited success overall. Institutional investors who hold government bonds now have a smaller spread to take profits in their on-lending activities but still maintain healthy bottom lines. But the government in Kingston has found it difficult to make the harsh job cutting and service slashes to suit international funders – a likely reason Golding recently stepped aside for others to make the politically tough decisions. Basseterre proposes cuts to principal and interest in addition to swapping off Crown lands to reduce its debt. Like Jamaica, the government is the largest employer. But unlike the larger neighbour job cuts are not openly spoken of. But in a world in which high tech communication, information processing and logistics are kings, and in which countries like St Kitts and Nevis and its OECS and CARICOM partners retain their status as clients delivering primary products, whether to OECD or BRIC states, the immediate future is debt, default and economic death before any glorious resurrection. With The corruption in the St. Kitts Government and especially the involvement of the Prime Minister in the Lex Consulting scandal this was fore seen. The people of that nation will suffer and the possibility of unrest is very real. St. kitts and Nevis have a program where they sell their passports under a citizen by investment scheme. Surley defaulting on their debts will shake investors confidence in that country. The millions of dollars that they get from the scheme will be greatly reduced or the Government make over look the due diligence necessary to approve the issuance of passports to all and sundry. The Government has obviously failed in managing it’s finances. They need an “Occupy St. kitts and Nevis movement” or to shake up the Government like Tunisia and Egypt and Lybia. Actually Lybia was to have invested a Bank in St. kiits just two years ago. The government has sold 4400 economic citizenships at USD250,000 apiece. Do the math–where is that money? Do the people of SKN think it is OK for their elected officials to rob them blind? The government has a vested interest in keeping the people uneducated and bound to the existing political parties who just alternate their turns at the trough. Do the people honestly think they won’t have to repay any of the debt? Where will the money come from? Look out for higher taxes… Who will invest in the Federation? There isn’t enough tourism in the world to bail them out this time–even if there wasn’t any crime. SKN is in a bad way and it isn’t going to get any better soon.